… And why your dog isn’t really lazy afterall! “Sweet Pea” is a six year-old Pyrenean Mountain dog that came to see Dr Anthony because she wasn’t herself. She seemed painful to get up and down and was not as interactive with the other dogs she lives with. Her owner had also noticed her coat had changed and she had “dandruff”. She had also gained weight. It can be easy to assume that any middle-aged to older dog that is struggling to get out of bed has arthritis. In fact, through a thorough work up of Sweet Pea’s symptoms we were able to determine that inability to get up and down easily was not actually due to arthritis but a metabolic disorder called Hypothyroidism. Her work up included blood tests and x-rays (in which we could not see evidence of any joint disease such as arthritis). The blood test showed a low thyroid hormone level and elevated cholesterol. This prompted the vet to test for Thyroid Stimulating Hormone which was found to be high. This means her brain is telling her body to produce thyroid hormone but her thyroid gland isn’t doing as it’s told! The good news for Sweet Pea is that her Hypothyroid disease is easily controlled by supplementing her with thyroid hormone tablets. Even though it has only been a couple of months, she is back to her usual self but will require treatment for the rest of her life. Hypothyroid disease is a metabolic disease of dogs whereby their thyroid gland doesn’t produce enough thyroid hormone. In over 90% of dogs this process is due to immune-mediated destruction of the thyroid cells. Secondary hypothyroidism can occur when there is a disease process in the pituitary gland of the brain, but is less common. It is usually seen in middle aged dogs with an average age of 7. Some breeds are more commonly affected such as Golden Retrievers, Beagles and Dobermans. As thyroid hormone regulates the metabolic rate and influences the functions of many organs, clinical signs are often non-specific and the diagnosis my not be immediately apparent. Signs can include lethargy, mental dullness, weight gain, exercise intolerance, alopecia, and obesity. Some dogs will “heat seek” i.e. be intolerant of the cold and lay around heaters or in the sun. Neurological signs such as stumbling can be commonly mistaken for arthritic signs. In severe cases dogs can develop myxoedema coma which is a life-threatening emergency, but thankfully is rarely seen. 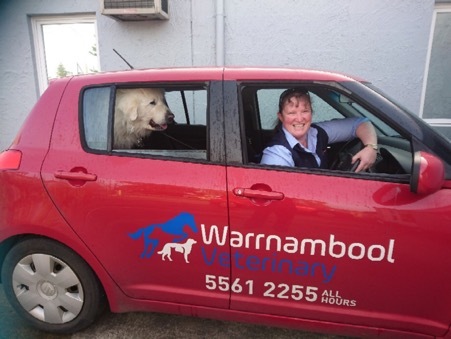 Here is our friendly vet nurse Sharon “delivering” Sweet Pea home! At Warrnambool Veterinary we can perform a screening test for hypothyroid disease in-house, giving you a same-day result. If we suspect your dog has hypothyroid disease we will run some more tests at an external lab to confirm the disease. If you are worried about your dog showing any of these signs, make an appointment to see if Hypothyroid disease could be affecting your furry friend.